I swear it was only a couple of months ago when I finished this top…but turns out it was July! All of these blocks were from an antique store in Port Townsend, WA. Someone had hand pieced them, and they were sitting in a box waiting to be made into a quilt. I posted more about this quilt on this post. I sent this to Kathy to have her quilt it with a long arm. She did a beautiful job bringing the dresdens to life. The backing is a Henry Glass print, and I bound it in white. I went back and forth what to bind it with but I love love love the white. …or make it into one of these for the winter??? (kidding!) 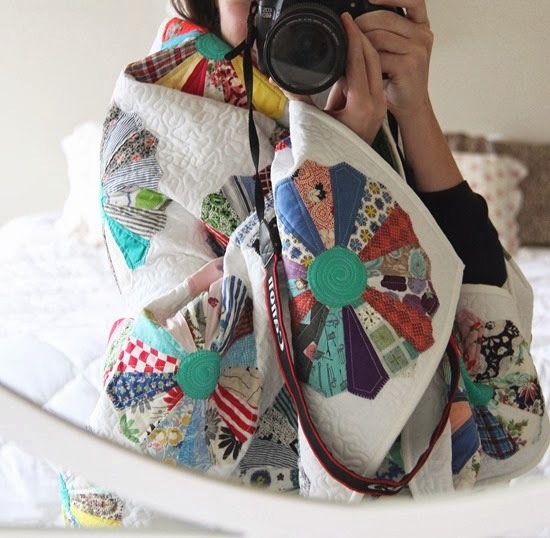 Everyone already thinks I’m a crazy quilt lady so I might as well work it! A beautiful quilt and the quilting complements the dresdens so well. Hugs…..
oh dear lord, do not make a coat out of that quilt! Yikes! It's far too beautiful for debauchery! Its beautiful! I love all your quilts :) And you are so lucky that you found the blocks!! It's beautiful and the white binding is just perfect. Your finding these in the antique shop would be like winning the lottery. What beautiful pieces,and the way you friend quilted it is lovely. I think it is perfection and love you wrapped up in it with your camera in hand. That is such a cute shot. It makes me smile. Those Dresdens are full of fun fabrics. I love the colors. It is just gorgeous! I can tell you put a lot of work into it. I love the white too! Such a beautiful and inspiring finish! I have a vintage quilt top that I would really like to finish soon. I'm having a terrible time deciding what to do with it, it's so special. I guess in the end it doesn't really matter, just that it does get finished, used, and loved! hehe – I luaghed a bit too much at this one – after buying patchwork pants on holidays I'm feeling the crazy quilt lady thing. 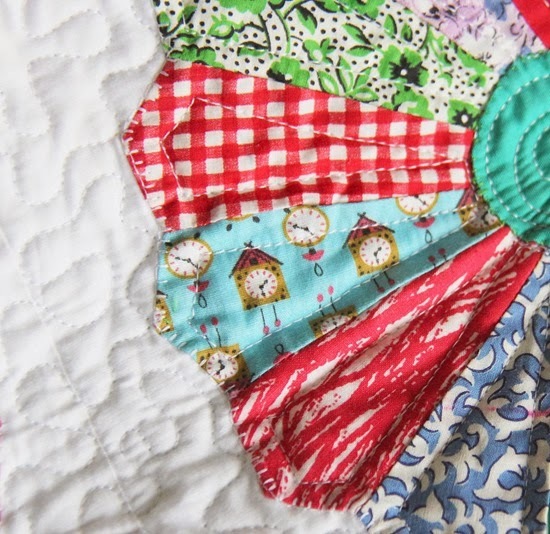 Got sooo many comments from people rolling their eyes saying 'so you're even sewing patchwork clothes?'. 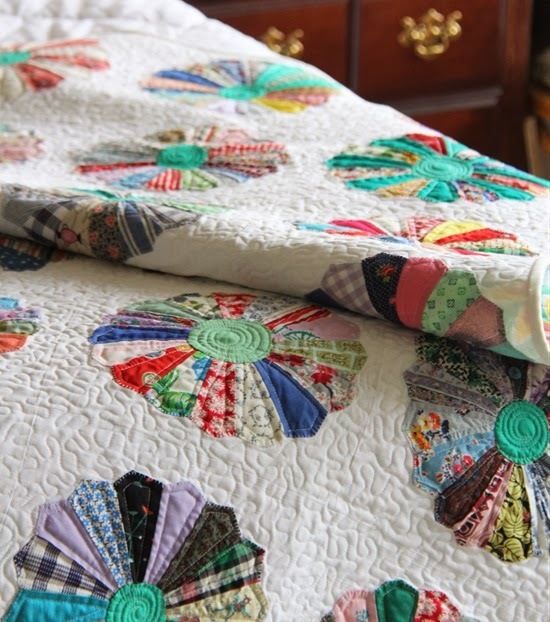 I love this quilt – the fact that it has been bought back to life after someone spent so long piecing all those dresdens is perfect and so special. 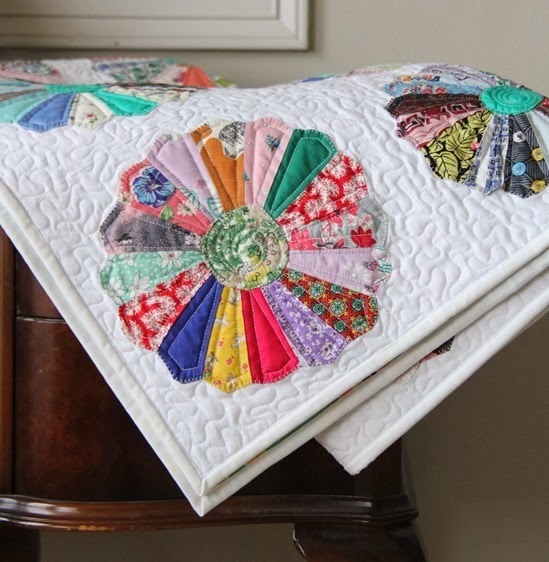 Such a treasured quilt Allison – love it. or a home in my home… tee hee. :) its gorgeous! So glad you rescued them! gorgeous; what a treasure those lonely blocks turned into!!! 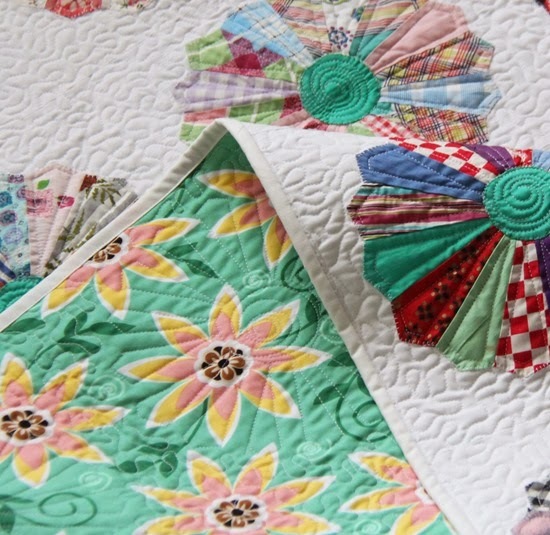 your quilter really did bring them to life with the perfect quilting! It's beautiful. Reminds me of a quilt that my mom and Grandma made with that same pattern. They would gather all their friends together, stretch the quilt on a huge frame my dad built and sit all around it quilting, laughing and drinking tea. Oh I have many memories like that. I wish I had one of those quilts. If you are ever going to put this one up for sale, would you consider letting me know? Thank you Allison for refreshing that memory today! That coat is hideous, whereas your quilt is beautiful! Well done for bringing it back to life! You are so fortunate to have found such beautiful dresdens. The quilt turned out gorgeous. Beautiful….how fun to rescue someone's hard work. I love the choice of backing…gives it a modern feel! The background stippling really makes the dresdens pop, along with the outline stitching on the pieces! what a beautiful quilt! wow, so happy you stumbled upon these blocks and treated them so well! It's really lovely knowing you rescued these guys and made them into a stunning quilt. It is simply beautiful. These blocks were just waiting to be loved. Hmm, I think I'd leave it as a quilt!! It's just stunning. Oh it's so beautiful as a quilt! My vote is for leaving it as is. It's absolutely stunning – what a find! Your quilt is beautiful! Whomever pieced those dresdens would be proud of what you have done with them! Very well done!!!! What a find! The quilt is gorgeous! Que lindo! E o tecido de trás combinou tão bem! I adore how this one turned out! How gorgeous! Love the quilting. Pretty funny, teasing to turn it into a coat!! :-P Lovely quilt, and I can't believe your luck in finding those blockS!! What a beautiful quilt! I love how you rescued those dresdens. You should totally make it into a kimono and wear it to market. You can even make a pocket to hold your business cards! Great find – lucky you to have come across these beautiful blocks! And a lovely rescue and finish. I just love that backing fabric!! This is just gorgeous. What a wonderful and serendipitous find. The person who stitched the original piecing would be so pleased it had found such a good home. 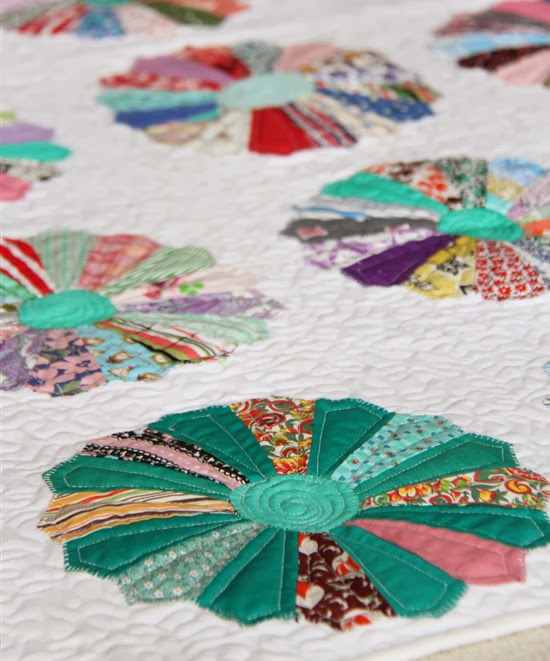 Beautiful, I love dresdens, they would have to be my favorite patchwork. Kathy, makes everything look better!! I LOVE the white binding! Well played! Beautiful allison!! I keep passing by those types of blocks in the Amish Thrift store I visit. I keep thinking – I already have enough projects. But seeing those blocks come to life gives me encouragement to take a closer look at them next time. I love the white binding too! It is beautiful! Thanks for posting it has been a great help to me. I have Dresden blocks my grandmother and great grandmother made from their old clothes. I have wanted to piece them together since I received them 30 years ago. I plan to make a wall hanging and put it under glass to preserve it. Thanks again!